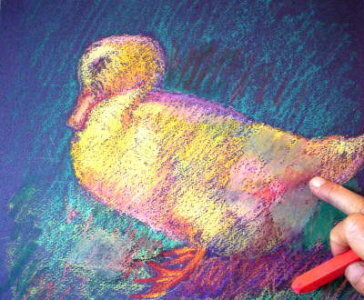 This demonstration is designed to illustrate basic oil pastel technique drawing a white duck. I will show you, step by step, how to use the key oil pastel technique-drawing with hatching, cross-hatching, and also touch on the use of washes. 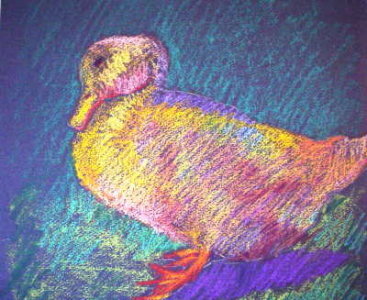 If you need oil pastel technique refresher before we get started, click here. For this exercise, I use my trusted Holbein Artist's Oil Pastel Sets on dark blue Canson pastel paper. 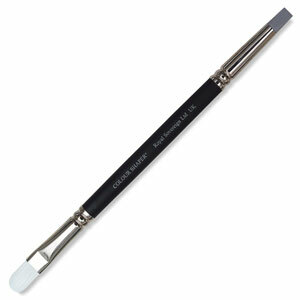 Each Holbein oil pastel comes in five —great for capturing the contrasts of light and shadow. 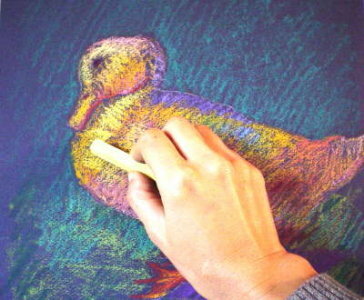 I choose dark blue paper because it will make the light colors of the duck really sparkle. Blue complements the orange-yellow feathers on the duck. Also, by using the dark paper, I can leave much of the background uncovered and complete the painting using less pastel than I would with a lighter colored surface. It gets tiring having to cover up the whole background with pigment! 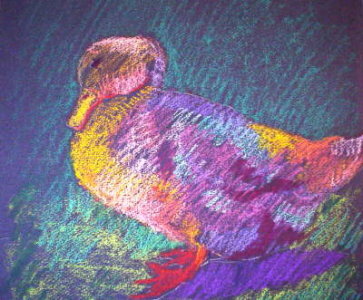 Using a white charcoal pencil, I draw the duck in the middle of the paper. I try not to place it in the dead center. Instead, to improve the composition, I shift it somewhat to the right side so that there is more room for its face than the tail. By squinting at the reference photo, I identify dark shadows and regions with mid-dark tones. I put these on the paper using a solid pressure on the pastel. The colors might be the wrong tone, but I can change them later. I continue to hatch colors into regions with mid-dark tones. I use mostly bright colors instead of brown or earth tone colors to keep the colors vibrant. I vary the colors of those same tones to avoid a monotonous color scheme. Now I start to build the middle tone regions here and there. I look for minute variations of the middle tones. Again, I squint at the reference photo often to identify these areas. I often have to hold myself back from jumping to the light tones; build those dark and middle tones first. I keep reminding myself of that. Next, I begin to model the light tones. Even now, I am not concerned about the highlights. 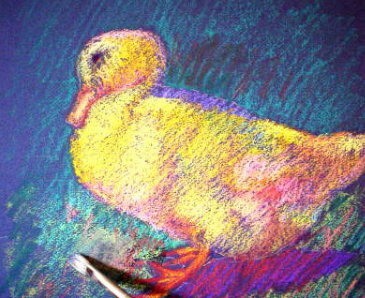 I am interested in achieving a light and airy look on the duck, so I do not need to leave an area for highlight. Now the colors look disjointed and broken, although the overall value relationship is basically correct. 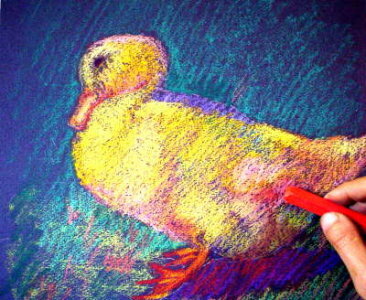 To fix this problem, I take a middle-dark yellow oil pastel and hatch all over the duck to unify the separate patches of color and smooth the transition from one color to another. Next, I give full attention to the light tones, the most exciting part of the oil pastel technique drawing demo. I squint at the photograph again and also the painting to gauge the tonal relationships. I identify three or four tones and vary the colors I use for the light tones (again, to avoid a monotonous color scheme). I flatten out some of the grass area with turpenoid. Then, I go back in and cross-hatch the muddied area with an oil pastel stick. The color instantly comes alive again; it's no big deal to recover from that kind of mistake. To finish the painting, I focus on the highlights and light tones. 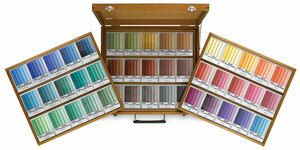 I also recover any lost dark tones by adding more dark or middle-toned colors. 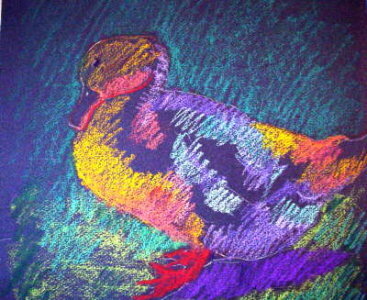 I also add some of the duck's colors onto the surroundings to harmonize the color. 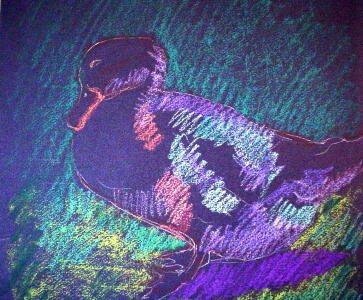 For example, I add deep orange into the grass, the duck's shadow, and the top of the duck. At last this oil pastel painting is done. The colors are vibrant, but not garish, and the tones look good. As I usually do, I set the finished painting aside for a while, and then come back later to see if I need to make changes. 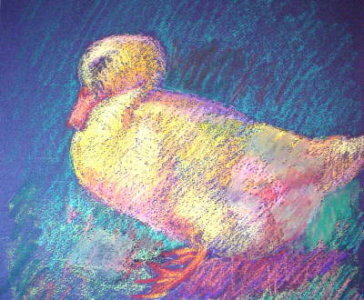 This demo illustrated the use of the most fundamental oil pastel technique—drawing primarily using hatching and cross-hatching. The use of washes is minimal—for accents only. I am satisfied with the textures of the painting. If you practice the oil pastel technique by drawing all kinds of subjects often, you will improve in no time. Just remember to focus on getting the tonal relationships right!